The Image of God is a concept and theological doctrine in Christianity and Judaism which asserts that human beings are created in God‘s image and therefore have inherent value independent of their utility or function. Man in the image of God; what does this mean in practical terms? It cannot refer to bodily, biological form since God is a Spirit and man is earthly. But while it may be true that the body does not belong to the image, since God does not have a body, yet somehow we would like to see man’s body (which is a very real part of man) included in the image. Language and creativity,—two important parts of the image, are impossible without a body. And God the Almighty agreed to share with man dominion and authority over the animal kingdom (Genesis 1:28), an activity in which the whole man, body as well as mind, is involved. Furthermore the Son of God honored the human body by becoming flesh and dwelling among men (John 1:14) (Hebrews 2:14). C. S. Lewis suggests that before the Fall, the first man, Adam mirrored Christ the man of Galilee even more nearly than Christ would have resembled his own half-brothers. If this is so, it seems almost blasphemy to consider Adam sired by a shambling ape. Humans in God’s image were intended at creation to bring glory to God as people who hadn’t sinned. Fallen humanity hasn’t lost the image of God, but the image is tarnished. “With Adam’s moral freedom to choose,” says Mark, “he rebelled against God, which has profoundly damaged the image of God in humanity and affects us in all areas of life. Through Jesus Christ’s death on the cross and resurrection, God is now restoring his original image in humans as they are transformed by following Jesus Christ.” The writer of Hebrews says of Jesus that “the Son is the radiance of God’s glory and the exact representation of his being, sustaining all things by his powerful word” (Hebrews 1:3-4). Jesus shows us who God is and what God is like. He is the radiance of the glory of God and the exact imprint of his nature, and he upholds the universe by the word of his power. After making purification for sins, he sat down at the right hand of the Majesty on high, having become as much superior to angels as the name he has inherited is more excellent than theirs. 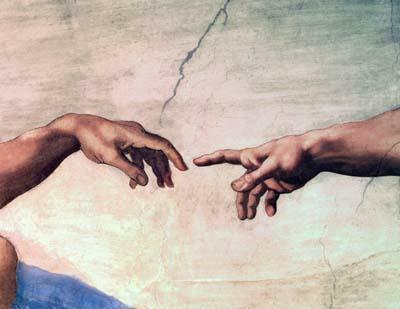 Thinking Through Faith: What is the “Image of God”? The Torah has additional references that indicate that mankind was created in the image of God. .This is the book of the generations of Adam. When God created man, he made him in the likeness of God. Male and female he created them, and he blessed them and named them Man when they were created. When Adam had lived 130 years, he fathered a son in his own likeness, after his image, and named him Seth. We are made in God’s image, but the potential value of this image will not be realized unless we become conformed to the image of Christ in our morality. To be living in God’s image, we must be in a right (i.e., moral) relationship with God and with other humans, using our minds and our authority to serve God and our fellow humans. This is what it means to be in the image of God and conformed to the perfect image, his Son. The Holy Bible states that Jesus Christ is the visible image of God. He has delivered us from the domain of darkness and transferred us to the kingdom of his beloved Son, in whom we have redemption, the forgiveness of sins. He is the image of the invisible God, the firstborn of all creation. For by him all things were created, in heaven and on earth, visible and invisible, whether thrones or dominions or rulers or authorities–all things were created through him and for him. In their case the god of this world has blinded the minds of the unbelievers, to keep them from seeing the light of the gospel of the glory of Christ, who is the image of God. For what we proclaim is not ourselves, but Jesus Christ as Lord, with ourselves as your servants for Jesus’ sake. For God, who said, “Let light shine out of darkness,” has shone in our hearts to give the light of the knowledge of the glory of God in the face of Jesus Christ. But we have this treasure in jars of clay, to show that the surpassing power belongs to God and not to us.